SureCall, one of the leaders in cell phone signal booster technology, has just released a new and improved version of their pioneering Force-5 signal booster, called the SureCall Force5 2.0, that features an FCC maximum +17 dBm downlink, Sentry remote monitoring, expanded automatic gain control (AGC), and is VoLTE certified. The new Force5 2.0 has 6 different kit options so that installers have the opportunity to match the best kit configuration to their specific building setup. Let's look at more of the specifics. When the FCC originally released their signal booster regulations, the downlink boosting power had to match the uplink, so if you had a strong outside signal, you were limited by the uplink power back to the tower. Since then, after proving that an increased downlink was not a risk of impacting the carriers' cell signals, the FCC has relaxed that requirement to allow an additional +17 dBM maximum downlink on boost systems. The new SureCall Force5 2.0 takes full advantage of this increased downlink power, so it is the perfect system if you have a very strong outside signal, as the system can turn that very strong signal in to the maximum possible coverage inside of the building. 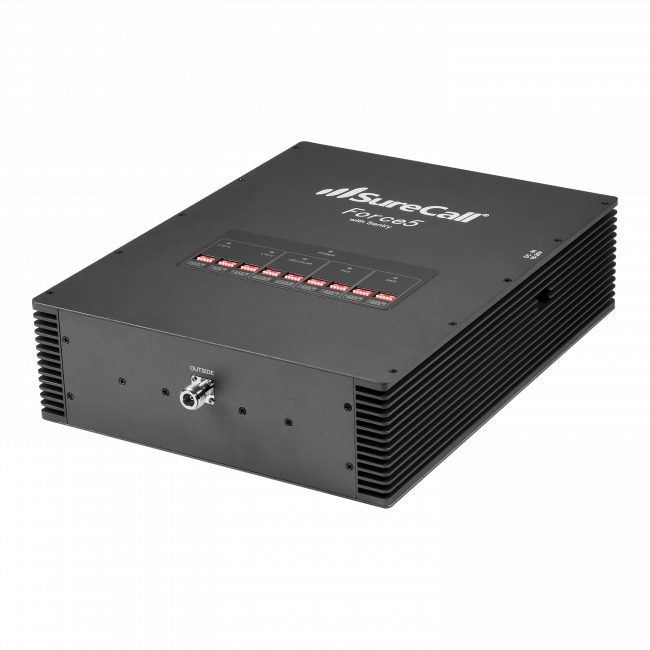 The new Force5 2.0 has a significantly increased AGC, which means that it is able to scale itself up and down in boosting power to accommodate any sort of outside signal environment. The previous version had a limit as to how far the gain control could adjust itself, but with this booster, that limitation has been removed, so it is a much more versatile amplifier. 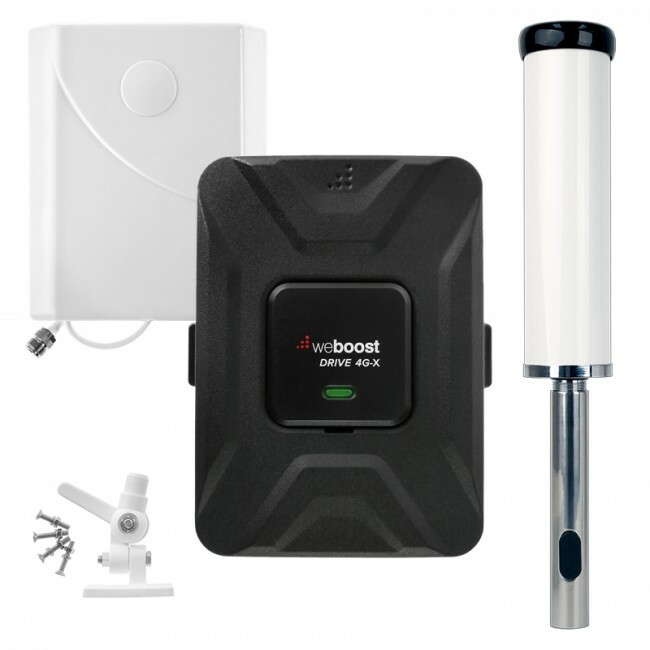 The SureCall Force5 2.0 Signal Booster includes a built-in remote monitoring solution called the Sentry. If you connect the amplifier to your internal network, then you can view and manage the amplifier from anywhere via the Sentry iOS or Android apps. 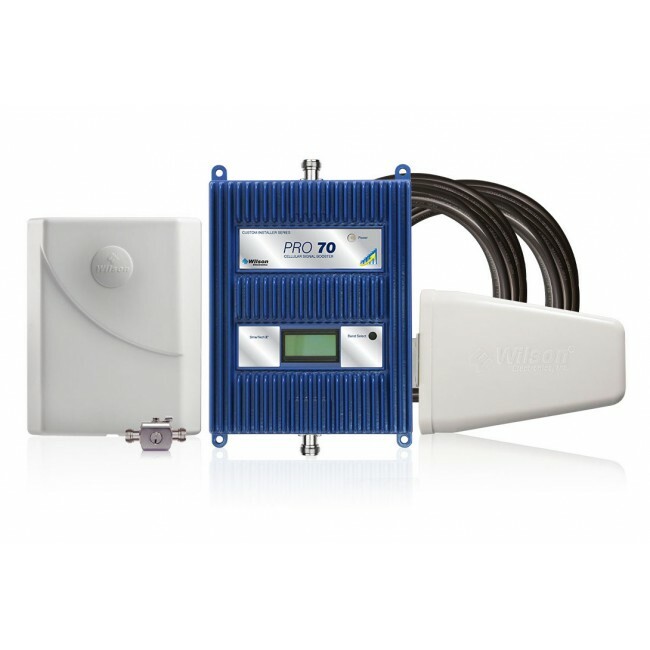 This will provide additional peace of mind for installers, ops, IT, or anyone who is tasked with cellular uptime, as they can monitor and adjust settings from anywhere in the world, day or night. The SureCall Force5 2.0 is one of the only boosters available that has been VoLTE certified, which is the standard that the carriers are moving towards for providing voice calls over the data networks. This certification confirms that the amplifier supports the VoLTE standard and will allow your users to make and receive VoLTE calls through the system. The Force5 2.0 provides the option of either an omni or yagi outside antenna, either a dome or panel inside antenna, as well as the option for 4 dome antennas (as well as the necessary cables and splitters). 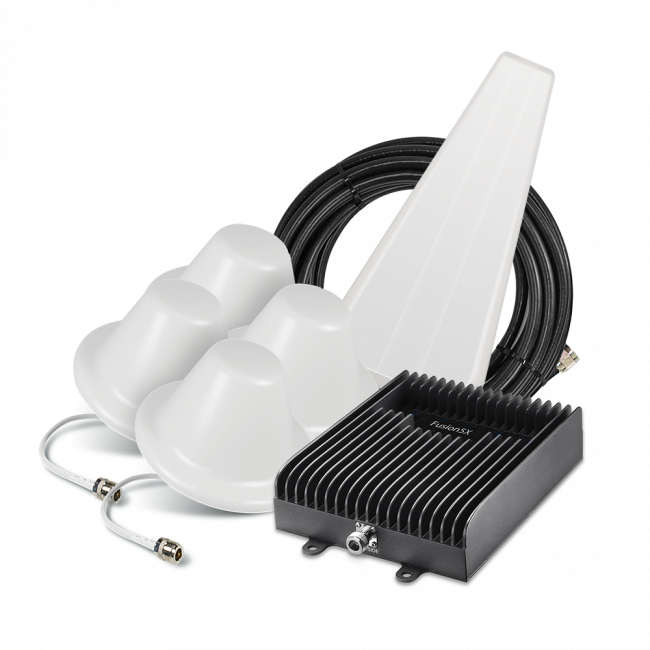 Any of these packages can be further expanded with better or different length cabling, more antennas, etc., to fit any building type. The Force5 2.0 also includes a lightning protector so the amplifier is protected against potential surges running down the outside antenna cable and impacting the amplifier. While the Force5 2.0 base packages are a great start for many installers, and may satisify some situations, for large or complex installations, UberSignal offers a system design service, free of charge, to ensure that you have the most effective system possible for your situation. In addition, we offer on-site survey and installation services, for situations where you want the entire project handled by experts, from beginning to end. Please contact us with any questions on either of these options. If you're looking for a start of the art system that will maximize your coverage and allow you to monitor and adjust at will, then the new SureCall Force5 2.0 signal booster system is going to be an ideal solution for your needs. Please contact us with any questions or to purchase this new system.